An employee was shot during a robbery at a Tourneau store in a Long Island mall that sparked a panicked stampede of shoppers Tuesday, and the suspected shooter is in custody, police and local officials said. Police said the gunman went into the Rolex section of the store in Roosevelt Field Mall shortly after 1 p.m. and attempted to rob the store. At some point, he tried to leave the shop and was met by store security. A scuffle ensued and one round was discharged from the suspect's gun, hitting a 67-year-old mall employee who had been standing outside the Tourneau doors, in the main part of the mall. "I heard 'pop, pop' and a loud smashing sound in the middle of my purchase," said shopper Mark Smith, who hid for over an hour in a store's locked back room. The mall employee was hit in the back and was taken to a hospital in serious but stable condition, authorities said. Authorities did not say which store he worked for. Mall security subdued the gunman and took his gun, and an off-duty NYPD officer who was shopping in the mall, Deputy Inspector Kenneth Lehr, jumped in to help keep the shooter down, the NYPD confirmed. Police then arrived and took the suspect into custody. He is being questioned at this time, authorities said. Rosie Peguero, a producer with NBC 4 New York sister station Telemundo 47, said she was coming out of the LEGO store in the mall when "all of a sudden we saw a whole bunch of people running toward us." Peguero said she and those she was with started running too and her group got pulled into a store. Everyone inside the store headed to the back of the room and the doors were closed, Peguero said. After a few minutes, they all left the store; some stores in the mall were closed, others were open and there appeared to be a lot of confusion, Peguero said. They then left the building. 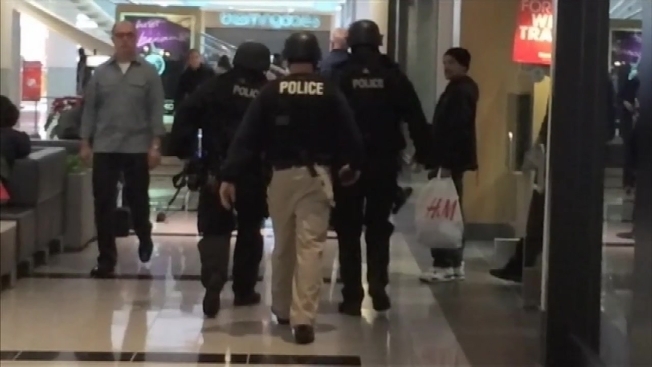 Cellphone video taken by shoppers and obtained by NBC 4 New York show scenes of chaos and panic inside the mall. Oscar Jaramillo recorded video of the food court in the aftermath, with chairs overturned and food abandoned and thrown on the floor. "Everybody ran right out of here," he says. Another woman filmed the scene from the storage room of the Louis Vuitton store, where panicked shoppers squeezed in when they saw people running, unsure of what was happening. "Nobody knows. Everybody started running, so everybody ran. It's better to run and hide," another shopper is heard saying. "I'm pretty sure something drastic had to happen. There's no way everybody would be running like that," says the woman recording the video. The shoppers in the storage room are visibly shaken, some panting. Other photos and videos posted to social media show several shoppers standing in the rain outside the mall, and at least one ambulance was seen at the scene. Mall officials say the mall was never put on lockdown and police stressed it was never considered an active shooting situation. By 2 p.m., about an hour after the initial situation, the mall had been declared safe and was open for business, a mall representative said. Police said they have no reason to believe the robbery is connected to a smash-and-grab that happened at the same mall around this time last year. Roosevelt Field Mall management issued a statement saying, "The safety of our tenants and shoppers remains a priority at all times. Roosevelt Field has been deemed safe by Nassau County Police Department for shoppers and employees and remains open to the public, with the exception of the area near the crime scene, as directed by Nassau County PD."